Michel Gondry’s latest fantastical cinematic offering, Mood Indigo, is an adaptation of a Boris Vian novel and stars the ever-versatile Romain Duris as Colin, a wealthy carefree man living with his lawyer and cook enthusiast friend Nicolas (Omar Sy). The pair reside in a bright, spacious apartment and indulge in delightful pastimes such as playing the “pianocktail” (different keys and tempos empty cocktail ingredients into a glass - a Willy Wonka-esque creation for grown ups). Colin’s life takes an even brighter turn when he meets Chloé (Audrey Tautou) who he soon marries. Everything changes dramatically for the newlyweds when Chloé has a water lily growing in her lung and Colin tries to do what he can to afford the growing medical expenses. Gondry (Eternal Sunshine of the Spotless Mind, The Science of Sleep and countless Bjork videos) dives into playful imagery with sharp attention to detail. The characters’ emotions burst out from every prop and special effect and there are lots of them to a dizzying yet exhilarating effect. Different styles are merged and harmonised such as the dance sequence with exaggerated long limbs not dissimilar to figures in 1930s animation. Music for the dance comes from multiple TV screens showing a Duke Ellington performance with a microphone adjusted in front of the one projecting his face to increase the volume. It’s the future with retro styling. Duris and Tautou share a tender on-screen chemistry as the ill-fated couple - even on the first date (unintentionally at a building site) there is a vulnerability that is endearing. Omar Sy exudes energy as the charismatic Nicolas who, like the other characters, has his natural spark drain away as hardship takes over. Other key performances which are equally powerful are delivered by Aïssa Maïga and Gad Elmaleh as the youthful and sensual Alise and the bookish Chick whose relationship takes a destructive turn with horrific consequences. 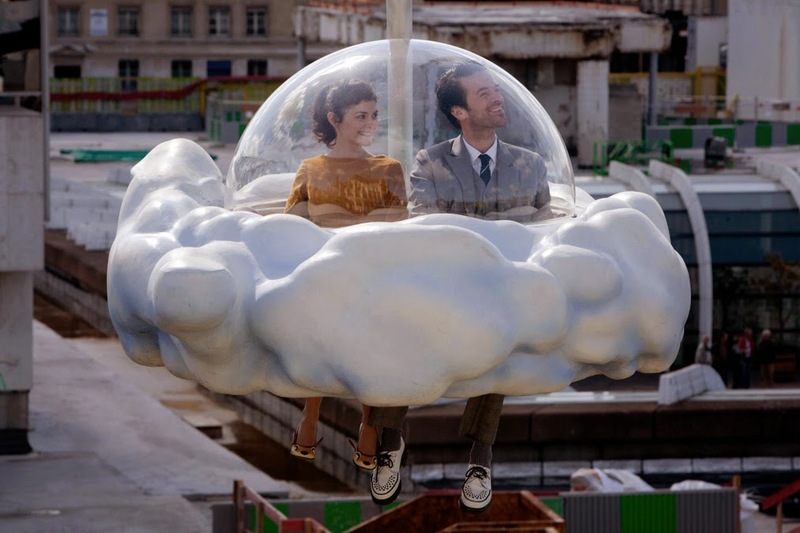 Mood Indigo plays like a hallucinogenic fairy tale in reverse, the eventual melancholy made all the more heart-rending due to the incredibly pure joy leaping from the screen at the start. A surreal and magical picture that is rightly unashamed in exploring the whimsical and has brought beauty back into the cinema in a way that is rarely seen now. Michel Gondry in many ways is a present day Powell and Pressburger. A treat for the eyes and one hell of a roller coaster for the heart.